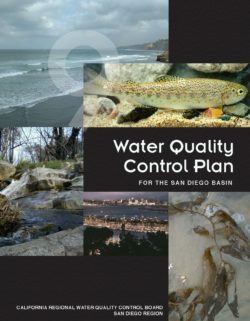 The objective of this Water Quality Control Plan for the Central Coastal Basin, or Basin Plan, is to show how the quality of the surface and ground waters in the Central Coast Region should be managed to provide the highest water quality reasonably possible. Water uses and water benefits vary. Water quality is an important factor in determining use and benefit. For example, drinking water has to be of higher quality than the water used to irrigate pastures. Both are legitimate uses, but the quality requirements for irrigation are different from those for domestic use. The plan recognizes such variations. This Basin Plan lists the various water uses (Beneficial Uses, Chapter Two). Second, it describes the water quality which must be maintained to allow those uses (Water Quality Objectives, Chapter Three). Federal terminology is somewhat different, in that beneficial uses and water quality objectives are combined and the combination is called Water Quality Standards. Chapter Four, the Implementation Plan, then describes the programs, projects, and other actions which are necessary to achieve the standards established in this plan. Chapter Five, Plans and Policies, summarizes State Water Resources Control Board (State Board) and Regional Water Quality Control Board (Regional Board) plans and policies to protect water quality. Chapter Six describes statewide surveillance and monitoring programs as well as regional surveillance and monitoring programs. these requirements; 2) water quality objectives are met; and, 3) beneficial uses are protected, water quality is controlled. projects which can affect water quality are reviewed and their impacts identified. Proposals which implement or help achieve the goals of the Basin Plan are supported; the Regional Board makes water quality control recommendations for other projects. 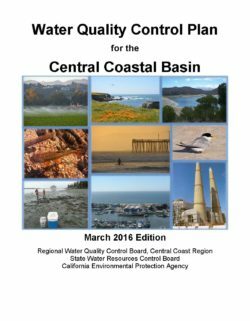 To check for any updates or amendments since this document was loaded into the library, please visit the Central Coast Regional Water Quality Board's basin plan page. The Los Angeles Regional Board's Basin Plan is designed to preserve and enhance water quality and protect the beneficial uses of all regional waters. Specifically, the Basin Plan (i) designates beneficial uses for surface and ground waters, (ii) sets narrative and numerical objectives that must be attained or maintained to protect the designated beneficial uses and conform to the state's antidegradation policy, and (iii) describes implementation programs to protect all waters in the Region. In addition, the Basin Plan incorporates (by reference) all applicable State and Regional Board plans and policies and other pertinent water quality policies and regulations. Those of other agencies are referenced in appropriate sections throughout the Basin Plan. The Basin Plan is a resource for the Regional Board and others who use water and/or discharge wastewater in the Los Angeles Region. Other agencies and organizations involved in environmental permitting and resource management activities also use the Basin Plan. Finally the Basin Plan provides valuable information to the public about local water quality issues. The Basin Plan is reviewed and updated as necessary. Following adoption by the Regional Board, the Basin Plan and subsequent amendments are subject to approval by the State Board, the State Office of Administrative Law (OAL), and the United States Environmental Protection Agency (USEPA). 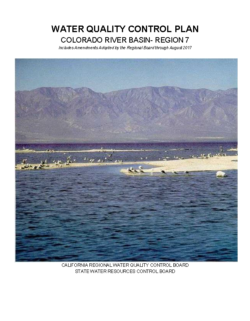 This Water Quality Control Plan (herein referred to as the Basin Plan) for the Colorado River Basin Region was prepared by the California Regional Water Quality Control Board, Colorado River Basin Region, in accordance with criteria contained in the California Porter-Cologne Water Quality Control Act, the Federal Clean Water Act, and other pertinent state and federal rules and regulations. The intent of the Basin Plan is to provide definitive guidelines, and give direction to the full scope of Regional Board activities that serve to optimize the beneficial uses of the state waters within the Colorado River Basin Region of California by preserving and protecting the quality of these waters. Water uses and water benefits vary. Water quality is an important factor in determining use and benefit. For example, drinking water has to be of higher quality than the water used to irrigate pastures. Both of these are beneficial water uses, but the quality requirements for irrigation water are different from those for drinking water. The Basin Plan recognizes the variations of water quality and water uses. This Basin Plan lists and defines the various beneficial water uses (Chapter 2). It describes the water quality which must be maintained to support such uses (Water Quality Objectives, Chapter 3). The section on implementation (Chapter 4) describes the programs, projects and other actions which are necessary to achieve the standards established in this Plan. Plans, Policies and Issues (Chapter 5), summarize the various plans and policies which protect water quality. This chapter also describes water quality issues which require special attention. Surveillance and Monitoring (Chapter 6), describes activities within the Colorado River Basin Region which are related to surveillance, monitoring, assessment, lab support, quality assurance and quality control. The Regional Board implements the Basin Plan by issuing and enforcing waste discharge requirements to persons; which can include individuals, communities, or businesses whose waste discharges may affect water quality. These requirements can be either state Waste Discharge Requirements for discharge to land, or federally delegated National Pollutant Discharge Elimination System permits for discharges to surface water. Dischargers are required to meet water quality objectives and thus protect beneficial uses. This Basin Plan also encourages water users to improve the quality of their water supplies, particularly where the wastewater they discharge is likely to be reused. Public works and other projects, which can affect water quality, are reviewed and their impacts are identified. Proposals, which implement or help achieve the goals of the Basin Plan, are supported. This Basin Plan is subject to review by the State Water Resources Control Board (State Board) and the United States Environmental Protection Agency (USEPA). The Basin Plan is, in itself, not a final statement on regional water quality planning, but is subject to continuous review and update as necessary. Updated sections of the plan may appear as periodic amendments, which are also subject to approval by the State Board and USEPA. 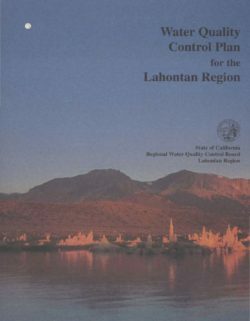 Water quality standards and control measures for surface and ground waters of the Lahontan Region are contained in the Water Quality Control Plan for the Lahontan Region (Basin Plan). The plan designates beneficial uses for water bodies and establishes water quality objectives, waste discharge prohibitions, and other implementation measures to protect those beneficial uses. State water quality standards also include a Nondegradation Policy. Water quality control measures include Total Maximum Daily Loads (TMDLs), which are often, but not always, adopted as Basin Plan amendments. See the Lahontan Water Board’s TMDL Program web page for further information. The Lahontan Basin plan took effect in 1995, replacing three earlier plans. The current edition of the plan includes fully approved sets of amendments adopted since 1995. Chapters and sections of the plan are available in separate files to facilitate downloading. In addition to the state standards in the Basin Plan, federal water quality standards for certain toxic pollutants apply to surface waters within California, including the Lahontan Region. These standards are contained in the National Toxics Rule (40 CFR 131.36) and the California Toxics Rule (40 CFR 131.37). The California State Water Resources Control Board (SWRCB) has adopted a statewide implementation policy for the federal toxics standards, including summary tables listing the standards themselves. The federal standards have not yet been physically incorporated into the Basin Plan. The National Toxics Rule and California Toxics Rule standards differ from federal water quality criteria in that they are enforceable. Federal criteria are non-enforceable, science-based thresholds that can be used in development of enforceable state water quality standards. For the latest information on this water quality control plan, including any amendments, click here. The basic purpose of the state's basin planning effort is to determine the future direction of water quality control for protection of California's waters. The goal of this Basin Plan is to provide a definitive program of actions designed to preserve and enhance water quality and to protect beneficial uses of water in the North Coast Region. The plan is concerned with all factors and activities which might affect water quality. It emphasizes, however, actions to be taken by the State Water Board and the Regional Water Board since they have primary responsibility for maintenance of water quality in the North Coast Region. This Basin Plan is comprehensive in scope. It contains a brief description of the North Coast Region, and describes its water quality and quantity problems and the present and potential beneficial uses of the surface and ground waters within the Region. The water quality objectives contained in the plan are prescribed for the purposes of protecting the beneficial uses. "Water Quality Control Policy for the Enclosed Bays and Estuaries of California". Provisions of State Water Board plans supersede basin plans; however, the same state plans may allow for site-specific objectives and exceptions in order to meet localized needs and circumstances. This Basin Plan is used as a regulatory tool by the Regional Water Board's technical staff. Regional Water Board orders cite the Basin Plan's water quality standards and prohibitions applicable to a particular discharge. The Basin Plan also is used by other agencies in their permitting and resource management activities. It also serves as an educational and reference document for staff, dischargers and members of the public. 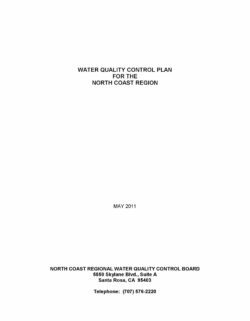 To check for any updates or amendments since this document was loaded into the library, please check the North Coast Regional Water Quality Control Plan's basin plan page. 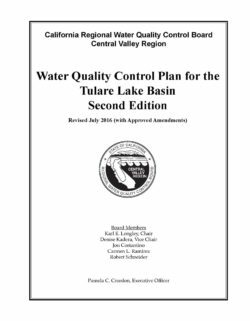 Water Quality Control Plans or “Basin Plans” provide the foundation for all Central Valley Water Board regulatory actions. Basin Plans identify beneficial uses of surface and ground waters, water quality objectives to protect those uses, implementation actions to achieve objectives, and a monitoring and surveillance program to insure that implementation actions are effective. All actions by the Board must be compliant with the Basin Plans. The Central Valley Water Board has two Basin Plans: one for the Sacramento and San Joaquin River Basins and one for the Tulare Lake Basin. A public review process is conducted every three years (Triennial Review) to identify and prioritize actions needed to address water quality concerns and maintain effectiveness of the Basin Plans. Upon Board approval of the Triennial Review work plan, staff investigates water quality issues and proposes amendments to the Basin Plans for Board consideration. Amendments may range from developing site specific water quality objectives for a single constituent such as copper, to basin-wide control programs for a suite of potential pollutants such as pyrethroids, to policy recommendations and strategies for addressing emerging contaminants and/or climate change. This basin plan has many sections with many amendments, and so no attempt is made to house this document in the library. Instead, please visit the Central Valley Regional Water Quality Control Board's basin planning page. The San Diego Regional Board's Basin Plan is designed to preserve and enhance water quality and protect the beneficial uses of all regional waters. Specifically, the Basin Plan: (1) designates beneficial uses for surface and ground waters; (2) sets narrative and numerical objectives that must be attained or maintained to protect the designated beneficial uses and conform to the state's antidegradation policy; (3) describes implementation programs to protect the beneficial uses of all waters in the Region; and (4) describes surveillance and monitoring activities to evaluate the effectiveness of the Basin Plan [California Water Code sections 13240 thru 13244, and section 13050(j)]. Additionally, the Basin Plan incorporates by reference all applicable State and Regional Board plans and policies. The goal of the Regional Board is to achieve a balance between the competing needs of mankind for water of varying quality. Often times the constituents and quality of water needed to protect various beneficial uses will be different. The Basin Plan is the Regional Board's plan for achieving the balance between competing uses of surface and ground waters in the San Diego Region. Accordingly, this Basin Plan establishes or designates beneficial uses and water quality objectives for all the ground and surface waters of the Region. Beneficial uses are the uses of water necessary for the survival and well being of man, plants and wildlife. These uses of water serve to promote the tangible and intangible economic, social, and environmental goals of mankind. Water quality objectives are the levels of water quality constituents or characteristics which must be met to protect the beneficial uses. This Basin Plan also establishes an implementation program describing the actions by the Regional Board and others that are necessary to achieve and maintain the designated beneficial uses and water quality objectives of the Region's waters. • The strategies and time schedules for achieving the water quality objectives. The Water Board first adopted a plan for waters inland from the Golden Gate in 1968. 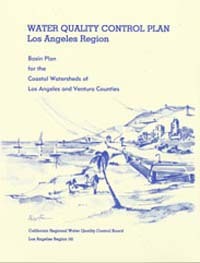 After several revisions, the first comprehensive Basin Plan for the Region was adopted by the Water Board and approved by the State Water Board in April 1975. Subsequently, major revisions were adopted in 1982, 1986, 1992, 1995, 2002, and 2004. Each proposed amendment to the Basin Plan is subject to an extensive public review process. The Water Board must then adopt the amendment, which is then subject to approval by the State Water Board. In most cases, the Office of Administrative Law and the U.S. Environmental Protection Agency (U.S. EPA) must approve the amendment as well. The basin planning process drives the Water Board?s effort to manage water quality. The Basin Plan provides a definitive program of actions designed to preserve and enhance water quality and to protect beneficial uses in a manner that will result in maximum benefit to the people of California. • The U.S. EPA requires such a plan in order to allocate federal grants to cities and districts for construction of wastewater treatment facilities. • The Basin Plan provides a basis for establishing priorities as to how both state and federal grants are disbursed for constructing and upgrading wastewater treatment facilities. • The Basin Plan fulfills the requirements of the Porter?Cologne Act that call for water quality control plans in California. • The Basin Plan, by defining the resources, services, and qualities of aquatic ecosystems to be maintained, provides a basis for the Water Board to establish or revise waste discharge requirements and for the State Water Board to establish or revise water rights permits. • The Basin Plan establishes conditions (discharge prohibitions) that must be met at all times. • The Basin Plan establishes or indicates water quality standards applicable to waters of the Region, as required by the federal Clean Water Act. • The Basin Plan establishes water quality attainment strategies, including total maximum daily loads (TMDLs) required by the Clean Water Act, for pollutants and water bodies where water quality standards are not currently met. The intent of this comprehensive planning effort is to provide positive and firm direction for future water quality control. However, adequate provision must be made for changing conditions and technology. The Water Board will review the Basin Plan at least once every three years. Unlike traditional plans, which often become obsolete within a few years after their preparation, the Basin Plan is updated as deemed necessary to maintain pace with technological, hydrological, political, and physical changes in the Region. 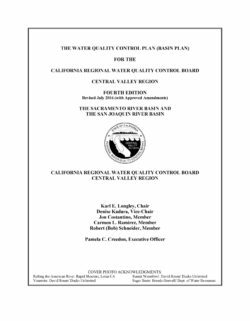 This Basin Plan contains water quality regulations adopted by the Water Board, and approved by the State Water Board, the Office of Administrative Law, and U.S. EPA. It also contains statewide regulations adopted by the State Water Board and other state agencies that refer to activities regulated by the Water Board. For the most recent list of statewide regulations applicable in the Region, please refer to the State Water Board’s ?Compendium of Current, Statewide Applicable Water Quality Regulations.? Federal laws and regulations also specify water quality standards and are available at U.S. EPA’s website. 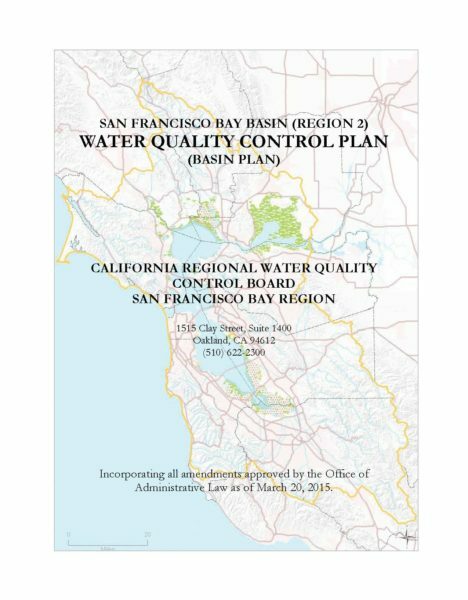 To check for amendments and other changes, please visit the San Francisco Regional Water Quality Control Board's basin planning page. 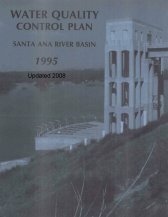 This document is the Basin Plan for the Santa Ana Region. The Santa Ana Regions includes the upper and lower Santa Ana River watersheds, the San Jacinto River watershed, and several other small drainage areas. The Santa Ana Region covers parts of southwestern San Bernardino County, western Riverside County, and northwestern Orange County. The Basin Plan for the Santa Ana Region is more than just a collection of water quality goals and policies, descriptions of conditions, and discussions of solutions. It is also the basis for the Regional Board’s regulatory programs. The Basin Plan establishes water quality standards for the ground and surface waters of the region. The term “water quality standards,” as used in the federal Clean Water Act, includes both the beneficial uses of specific waterbodies and the levels of quality which must be met and maintained to protect those uses. The Basin Plan includes an implementation plan describing the actions by the Regional Board and others that are necessary to achieve and maintain the water quality standards. The Regional Board regulates waste discharges to minimize and control their effects on the quality of the region’s ground and surface water. Permits are issued under a number of programs and authorities. The terms and conditions of these discharge permits are enforced through a variety of technical, administrative, and legal means. Water quality problems in the region are listed in the Basin Plan, along with the causes, where they are known. For waterbodies with quality below the levels necessary to allow all the beneficial uses of the water to be met, plans for improving water quality are included. In some cases, it has been necessary for the Regional Board to completely prohibit the discharge of certain materials. Some types of discharges are prohibited in specific areas. Details on these prohibitions also appear in the Basin Plan. The Central Valley Region includes about 40% of the land in California and stretches from the Oregon border to the Kern County/Los Angeles County line. It is bound by the Sierra Nevada Mountains on the east and the Coast Range on the west. The Region is divided into three basins: the Sacramento River Basin, the San Joaquin River Basin, and the Tulare Lake Basin. This basin plan covers only the Tulare Lake Basin. The Sacramento River Basin and the San Joaquin River Basin are covered in a separate basin plan. The Tulare Lake Basin comprises the drainage area of the San Joaquin Valley south of the San Joaquin River. Company’s Main Lift Canal. The basin boundary then follows the Main Lift Canal to the Mendota Pool and continues eastward along the channel of the San Joaquin River to the southern boundary of the Little Dry Creek watershed (Hydrologic Subareas No. 540.70 and 545.30) and then follows along the southern boundary of the San Joaquin River drainage basin. Surface water from the Tulare Lake Basin only drains north into the San Joaquin River in years of extreme rainfall. This essentially closed basin is situated in the topographic horseshoe formed by the Diablo and Temblor Ranges on the west, by the San Emigdio and Tehachapi Mountains on the south, and by the Sierra Nevada Mountains on the east and southeast. make up slightly less than one-half of the total basin land area. The maximum length and width of the Basin are about 170 miles and 140 miles, respectively. This plan contains all amendments up to July of 2016. To check for the latest version or for any new amendments, click here.